In the wake of Independence Day festivities surrounding the U.S. July 4th holiday, astronomers and image processors at the Space Telescope Science Institute are releasing the Hubble Space Telescope image of a cosmic explosion that is quite similar to fireworks on Earth. 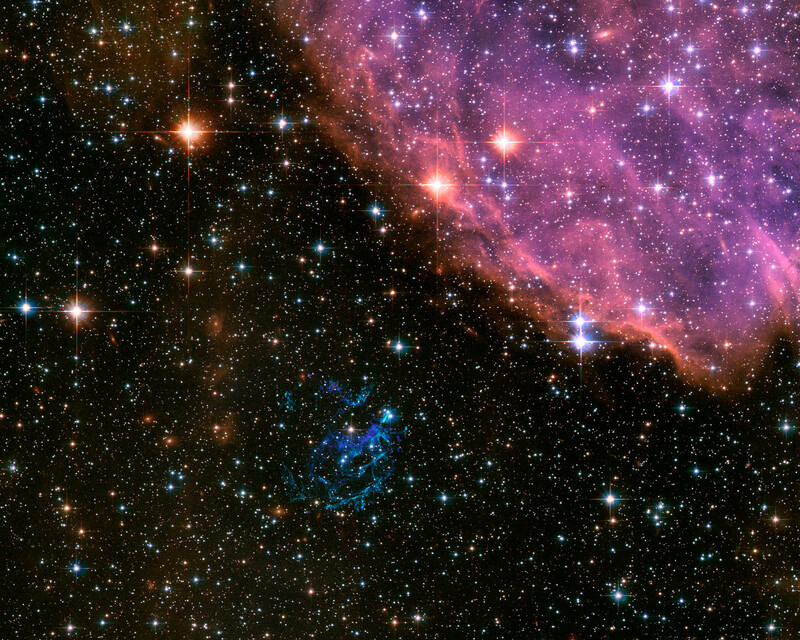 In the nearby galaxy, the Small Magellanic Cloud, a massive star has exploded as a supernova, and begun to dissipate its interior into a spectacular display of colorful filaments. The supernova remnant (SNR), known as "E0102" for short, is the greenish-blue shell of debris just below the center of the Hubble image. Its name is derived from its cataloged placement (or coordinates) in the celestial sphere. More formally known as 1E0102.2-7219, it is located almost 50 light-years (15 parsecs) away from of the edge of the massive star-forming region, N 76, also known as Henize 1956 in the Small Magellanic Cloud. This delicate structure glowing a multitude of lavenders and peach hues, resides in the upper right of the image. The composition and thus, the coloring, of the diffuse remnant in comparison to its star-forming neighbor is due to the presence of very large quantities of oxygen compared to hydrogen. E0102 is a member of the oxygen-rich class of SNRs showing strong oxygen and other more metal-like abundances in its optical and X-ray spectra, and an absence of hydrogen and helium. N 76 in contrast is made up primarily of glowing hydrogen emission. One explanation for the abundance of oxygen in the SNR is that the parent star was very large and old, and had blown away most its hydrogen as stellar wind before it exploded. It is surmised that the progenitor star that caused the supernova explosion may have been a Wolf-Rayet. These stars, which can be upward of 20 times the mass of the sun and tens of thousands times more luminous, are famous for having a strong stellar wind throughout their lifetime. This stellar wind carried off material from the outer-most shells of the star (the hydrogen and helium shells), leaving the next most abundant element, oxygen, as a visible signature after the star exploded as a supernova. Determined to be only about 2000 years old, E0102 is relatively young on astronomical scales and is just beginning its interactions with the nearby interstellar medium. 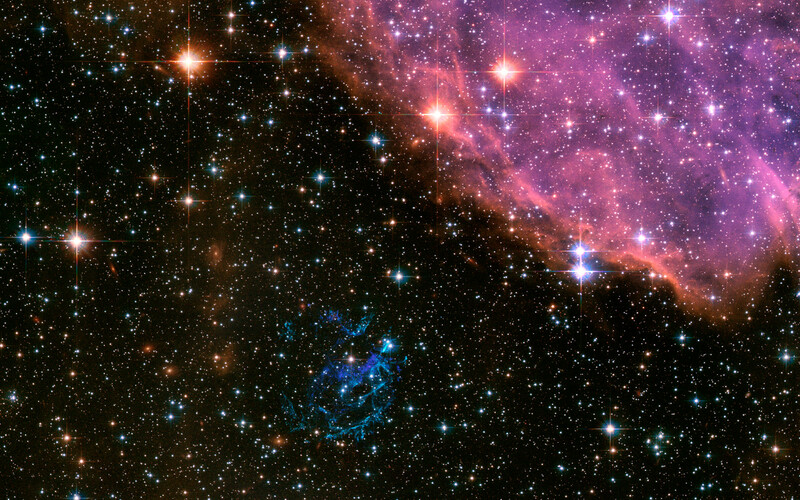 Young supernova remnants like E0102 allow astronomers to examine material from the cores of massive stars directly. This in turn gives insight on how stars form, their composition, and the chemical enrichment of the surrounding area. As well, young remnants are a great learning tool to better understand the physics of supernova explosions. The Small Magellanic Cloud is a nearby dwarf galaxy to our own Milky Way. It is visible in the Southern Hemisphere, in the direction of the constellation Tucana, and lies roughly 210,000 light-years (65 000 parsecs) distant. Position (Dec): -72° 2' 6.70"